As I went to blog about my new Mac-Mini, I searched for a post describing the Windows computer that would be the Mini's neighbor. To my surprise, I apparently never got around to blogging about it. And it's not because the Windows computer was forgettable, on the contrary, it's quite a zippy little machine deserving of a review. So here it is, better late than never. First off, I got the idea for purchasing what amounts to a Windows-Mini computer from this post: The Scooter Computer. Like all nearly everything on CodingHorror.com, it's impeccably researched and smartly written. While the use case for the computer in that article was markedly different than what I was after, I was intrigued enough to learn more. What finally got me to hit the buy button was the form factor of the computer. For years, I'd purchased laptop after laptop. And while I still do occasionally need both the power and portability of a laptop, most days I can make do with either. That is, I'm either in front of my dual monitor setup (power! ); or hacking away on my portable keyboard and cell phone (portability!). Better to invest the money in processing power and RAM than purchasing a slick laptop which would serve to do little more than power my existing monitors and keyboard. I recall being psyched I could deck the machine out with 16GB of RAM, something that was unusual to find in a laptop. I also choose to up the other specs as much as possible and hit the buy button. At around $460, I figured I might as well splurge. I'd never purchased anything on Ali Express, so I didn't really know what to expect. To my delight, the customer service was quite good, with the seller answering many of questions and offering to tweak the order as I needed it. This was the first time I'd purchased a non-major brand PC, and given my experience I'd gladly do it again. The computer is silent. The Mac-Mini makes this tiny tinkling noise, which I'd never notice, except I was putting it next to an even quieter computer. Gone are the days of loud laptop fans preparing for take off. Whoo! The device is USB port heaven - there are 4 ports on the front and 4 ports on the back. Again, compared to my Mac-Mini, this thing is luxurious. It (Mostly -- see below) Just Works. Windows runs well on this bad boy, and most days I don't have to think about hardware, which is sort of the point. At times I've struggled with mouse stuttering and lag. I've tried replacing batteries and mice. I've tried USB vs. Bluetooth. These days it's not a huge problem, but occasionally the problem strikes again. I always assumed it was due to limited processing power. Though, I've struggled with the same exact issue on my Mac-Mini. Mice are awful. The 256GB SSD is fast and all, but its capacity is tiny. In just a few months I managed to fill it up. 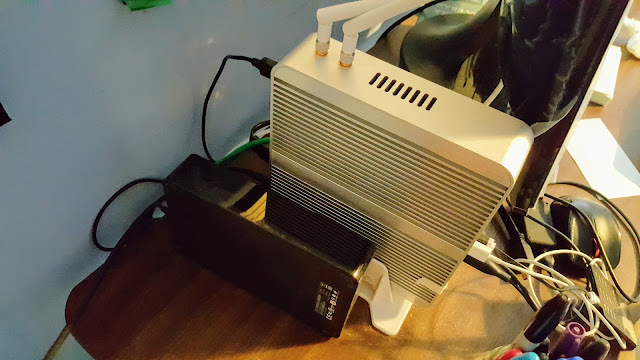 As a quick fix, I was able to plug in a random 1TB USB hard drive which I had lying around. However, file access times can be horrendously slow with the derive. I've found that I basically use the external drive as a sort of swap space, storing less used projects and files there. At some point, I really do need to fix this and upgrade *something*. For years, hard drives kept getting bigger and bigger, so I never gave a second thought to them. With these tiny SSD drives, it's back to being an issue. Webcam, Microphone and Speaker not included. Well, duh. Ultimately, the fact that the computer needs an external camera, mic and speaker is probably a good thing, as these accessories are cheap and easy enough to upgrade. But if you do plan to take the computer out of the box and use it on a Skype call, don't be surprised when you're not able to fully participate. After nearly a year of use, I can say that this no-name Mini-PC is really working out quite well. When it's time to retire this bad boy (probably at the end of the year), I'll probably opt to purchase a similar one as a replacement. Incidentally, if you're looking for a computer that you can just use for surfing, checking mail and watching YouTube, here's a better option: ChromeBit. But if you want to do actual computing, this device should have you covered.